So I did a little parsin' and figurin', and this is what I get. Our normal PHRF section break runs from 60 - 72. We are usually the lowest performance boat in the section. There are 2 ways to think how that handicap works. The second way of figuring all this out is to look at relative times. Given the above example, we know that over a mile long course, Jahazi would owe us 21 seconds/mile, so for every mile of race, we pick up 21 seconds. Most races are roughly 5 miles long (up to 7, usually,) so we know that if we finish within 1:05 of Jahazi, we will correct over them. Under ORR, things are run a bit differently. You are given a corrected time OVER TIME. The number you see as a handicap is multiplied by time racing, and then that is your corrected time. So, up to a point, the longer you are on the water, the more time you might be 'owed.' Of course, if other boats are zipping ahead, you still need to finish in a reasonable time. So, for every hour on the racecourse, using the same example, Jahazi, corrected, only races ".934" of an hour, we race only ".918" of an hour. 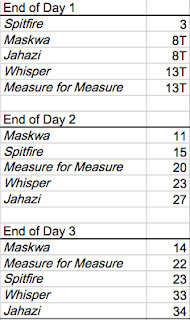 Using it as a time multiplier, then, we get Jahazi with a corrected finish of 56:35, and Maskwa finishing in a time of 55.05, or a 1:30 difference for every hour of racing. 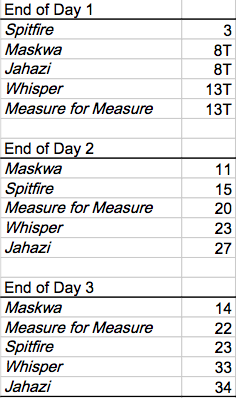 The time 'allowed' difference per hour between Jahazi and Whisper (or M4M,) is 5:24, or nearly 10% of the time spent racing. The true purpose of a handicap system is so that boats with similar performance but not wildly different performance can race against each other. 10% of the race time would count as wildly different, IMNSHO. So, I re-ran the NOOD Regatta under PHRF. The results were as expected, dramatic. Here is a screen shot of the google docs file. I converted Elapsed time into seconds, then subtracted the seconds allowed per mile for PHRF. One of the problems with TOT racing types is they don't keep that accurate a distance of the distance, because only time matters to them. The distance lost for the gate was probably mostly made up for by the offset on our course.. they were RIGHT THERE. Blue numbers are finish position for each race. Red numbers are daily position totals at the end of racing. Green numbers are cumulative position. As you can see, the results are quite different, especially when you compare them to the actual results. Well, we know it gives us a small advantage over a small number of boats, but over.. say... 55 hours of the Mac, with Whisper taking 64 hours, we would owe them another 49 minutes (or so...) meaning, that they would correct over and beat us. Finishing 9 hours later. Ouch. No matter how you slice it, it pays to be as fast as you can. p.s... this is one of the reasons why one design sailing is so popular. However, you need to have enough boats to race head to head (it's simple... first over the finish line wins.) I checked on LMPHRF, and there are 5 C&C 115s listed as having a handicap for 2012. Maskwa, Paradigm Shift, Nighthawk, Aquila II, and Bella. Only the first 2 race regularly.